The Siberian Husky (Russian: Сибирский хаски, tr. Sibirskiy khaski) is a medium size working dog breed that originated in Northeast Asia. The breed belongs to the Spitz genetic family. With proper training, they make great sled dogs. It is recognizable by its thickly furred double coat, erect triangular ears, and distinctive markings, and is smaller than a very similar-looking dog, the Alaskan Malamute. The original Siberian Huskies were bred by the Chukchi people — whose hunter-gatherer culture relied on their help. It is an active, energetic, resilient breed, whose ancestors lived in the extremely cold and harsh environment of the Siberian Arctic. William Goosak, a Russian fur trader, introduced them to Nome, Alaska during the Nome Gold Rush, initially as sled dogs. The people of Nome referred to Siberian Huskies as "Siberian Rats" due to their size of 40–50 lb (18–23 kg), versus the Malamutes size of 75–85 lb (34–39 kg). The first dogs arrived in the Americas 12,000 years ago; however, people and their dogs did not settle in the Arctic until the Paleo-Eskimo people 4,500 years ago and then the Thule people 1,000 years ago, both originating from Siberia. The Siberian Husky was originally developed by the Chukchi people of the Chukchi Peninsula in eastern Siberia. They were brought to Nome, Alaska, in 1908 for sled-dog racing. In 1989, a study was made of ancient canis remains dated to the Late Pleistocene and early Holocene that had been uncovered by miners decades earlier around Fairbanks, Alaska. These were identified as Canis lupus and described as "short-faced wolves". The collection was separated into those specimens that looked more wolf-like (i.e. the Beringian wolf), and those that looked more dog-like and in comparison to the skulls of Eskimo dogs from both Greenland and Siberia thought to be their forerunners. In 2015, a study using a number of genetic markers indicated that the Siberian Husky, the Alaskan Malamute and the Alaskan husky share a close genetic relationship between each other and were related to Chukotka sled dogs from Siberia. They were separate to the two Inuit dogs, the Canadian Eskimo Dog and the Greenland dog. In North America, the Siberian Husky and the Malamute both had maintained their Siberian lineage and had contributed significantly to the Alaskan husky, which showed evidence of crossing with European breeds that were consistent with this breed being created in post-colonial North America. Nearly all dog breeds' genetic closeness to the gray wolf is due to admixture. However, several Arctic dog breeds show a genetic closeness with the now-extinct Taymyr wolf of North Asia due to admixture. These breeds are associated with high latitudes - the Siberian Husky and Greenland dog that are also associated with arctic human populations and to a lesser extent, the Shar Pei and Finnish spitz. An admixture graph of the Greenland dog indicates a best-fit of 3.5% shared material, however an ancestry proportion ranging between 1.4% and 27.3% is consistent with the data. This indicates admixture between the Taymyr wolf population and the ancestral dog population of these 4 high-latitude breeds. This introgression could have provided early dogs living in high latitudes with phenotypic variation beneficial for adaption to a new and challenging environment. It also indicates the ancestry of present-day dog breeds descends from more than one region. A Siberian Husky's coat is thicker than that of most other dog breeds, It has two layers: a dense undercoat and a longer topcoat of short, straight guard hairs. It protects the dogs effectively against harsh Arctic winters, and also reflects heat in the summer. It is able to withstand temperatures as low as −50 to −60 °C (−58 to −76 °F). The undercoat is often absent during shedding. Their thick coats require weekly grooming. Siberian Huskies come in a variety of colors and patterns, usually with white paws and legs, facial markings, and tail tip. The most common coats are black and white, then less common copper-red and white, grey and white, pure white, and the rare "agouti" coat, though many individuals have blondish or piebald spotting. Striking masks, spectacles, and other facial markings occur in wide variety. Merle coat patterns are not allowed. The American Kennel Club allows all coat colors from black to pure white. The American Kennel Club describes the Siberian Husky's eyes as "an almond shape, moderately spaced and set slightly obliquely." The AKC breed standard is that eyes may be brown, blue or black; one of each or Particoloured are acceptable (complete is heterochromia). These eye-color combinations are considered acceptable by the American Kennel Club. The parti-color does not affect the vision of the dog. Show-quality dogs are preferred to have neither pointed nor square noses. The nose is black in gray dogs, tan in black dogs, liver in copper-colored dogs, and may be light tan in white dogs. In some instances, Siberian Huskies can exhibit what is called "snow nose" or "winter nose." This condition is called hypopigmentation in animals. "Snow nose" is acceptable in the show ring. Siberian Husky tails are heavily furred; these dogs will often curl up with their tails over their faces and noses in order to provide additional warmth. As pictured, when curled up to sleep the Siberian Husky will cover its nose for warmth, often referred to as the "Siberian Swirl". The tail should be expressive, held low when the dog is relaxed, and curved upward in a "sickle" shape when excited or interested in something. It should be symmetrical, and not curved or deviated to the side; the tail can curl enough to touch the back. The breed standard indicates that the males of the breed are ideally between 20 and 24 inches (51 and 61 cm) tall at the withers and weighing between 35 and 65 pounds (16 and 29 kg). Females are smaller, growing to between 19 to 23 inches (48 to 58 cm) tall at the withers and weighing between 30 to 60 pounds (14 to 27 kg). The Husky howls rather than barks. They have been described as escape artists, which can include digging under, chewing through, or even jumping over fences. Because the Siberian Husky had been raised in a family setting by the Chukchi and not left to fend for themselves they could be trusted with children. The ASPCA classifies the breed as good with children. It also states they exhibit high energy indoors, have special exercise needs, and may be destructive "without proper care". Siberian Huskies have a high prey drive due to the Chukchi allowing them to roam free in the summer. The dogs hunted in packs and preyed on wild cats, birds, and squirrels, but with training can be trusted with other small animals. They would only return to the Chukchi villages when the snow returned and food became scarce. Their hunting instincts can still be found in the breed today. A 6 ft (1.83 m) fence is recommended for this breed as a pet, although some have been known to overcome fences as high as 8 ft (2.44 m). Electric pet fencing may not be effective. They need the frequent companionship of people and other dogs, and their need to feel as part of a pack is very strong. A 1999 ASPCA publication shows the average life span of the Siberian Husky is 12 to 14 years. Health issues in the breed are mainly genetic, such as seizures and defects of the eye (juvenile cataracts, corneal dystrophy, canine glaucoma and progressive retinal atrophy) and congenital laryngeal paralysis. Hip dysplasia is not often found in this breed; however, as with many medium or larger-sized canines, it can occur. The Orthopedic Foundation for Animals currently has the Siberian Husky ranked 155th out of a possible 160 breeds at risk for hip dysplasia, with only two percent of tested Siberian Huskies showing dysplasia. Siberian Huskies used for sled racing may also be prone to other ailments, such as gastric disease, bronchitis or bronchopulmonary ailments ("ski asthma"), and gastric erosions or ulcerations. Modern Siberian Huskies registered in the US are largely the descendants of the 1930 Siberia imports and of Leonhard Seppala’s dogs, particularly Togo. The limited number of registered foundational dogs has led to some discussion about their vulnerability to the founder effect. The Siberian Husky, Samoyed, and Alaskan Malamute are all breeds directly descended from the original sled dog. It is thought that the term "husky" is a corruption of the nickname "Esky" once applied to the Eskimo and subsequently to their dogs. Breeds descending from the Eskimo dog or Qimmiq were once found throughout the Northern Hemisphere from Siberia to Canada, Alaska, Greenland, Labrador, and Baffin Island. Dogs from the Anadyr River and surrounding regions were imported into Alaska from 1908 (and for the next two decades) during the gold rush for use as sled dogs, especially in the "All-Alaska Sweepstakes," a 408-mile (657-km) distance dog sled race from Nome, to Candle, and back. Smaller, faster and more enduring than the 100- to 120-pound (45- to 54-kg) freighting dogs then in general use, they immediately dominated the Nome Sweepstakes. Leonhard Seppala, the foremost breeder of Siberian Huskies of the time, participated in competitions from 1909 to the mid-1920s. In 1930, exportation of the dogs from Siberia was halted. The same year saw recognition of the Siberian Husky by the American Kennel Club. Nine years later, the breed was first registered in Canada. 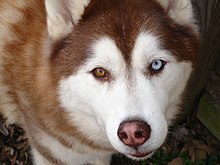 The United Kennel Club recognized the breed in 1938 as the "Arctic Husky," changing the name to Siberian Husky in 1991. Seppala owned a kennel in Nenana before moving to New England, where he became partners with Elizabeth Ricker. The two co-owned the Poland Springs kennel and began to race and exhibit their dogs all over the Northeast. 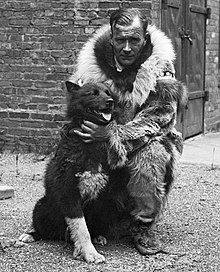 As the breed was beginning to come to prominence, in 1933 Navy Rear Admiral Richard E. Byrd brought about 50 Siberian Huskies with him on an expedition in which he hoped to journey around the 16,000-mile coast of Antarctica. Many of the dogs were trained at Chinook Kennels in New Hampshire. Called Operation Highjump, the historic trek proved the worth of the Siberian Husky due to its compact size and greater speeds. Siberian Huskies also served in the United States Army's Arctic Search and Rescue Unit of the Air Transport Command during World War II. Their popularity was sustained into the 21st century. They were ranked 16th among American Kennel Club registrants in 2012, rising to 14th place in 2013. The original sled dogs bred and kept by the Chukchi were thought to have gone extinct, but Benedict Allen, writing for Geographical magazine in 2006 after visiting the region, reported their survival. His description of the breeding practiced by the Chukchi mentions selection for obedience, endurance, amiable disposition, and sizing that enabled families to support them without undue difficulty. Siberians gained in popularity with the story of the "Great Race of Mercy," the 1925 serum run to Nome, featuring Balto and Togo. Although Balto is considered the more famous, being the dog that delivered the serum to Nome after running the final 53-mile leg, it was Togo who made the longest run of the relay, guiding his musher Leonhard Seppala on a 91-mile journey that included crossing the deadly Norton Sound to Golovin. 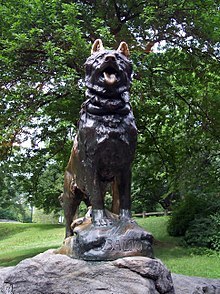 The bronze statue of Balto that has been displayed in New York City’s Central Park since 1925 is one of its enduringly popular features. Several purebred Siberian Huskies portrayed Diefenbaker, the "half-wolf" companion to RCMP Constable Benton Fraser, in the CBS/Alliance Atlantis TV series Due South. In 1960, the US Army undertook a project to construct an under the ice facility for defense and space research, Camp Century, part of Project Iceworm involved a 150+ crew who also brought with them an unofficial mascot, a Siberian Husky named Mukluk. Siberian Huskies are the mascots of the athletic teams of several schools and colleges, including: St. Cloud State University (St. Cloud State Huskies, Blizzard), Northern Illinois University (Northern Illinois Huskies, Victor), the University of Connecticut (Connecticut Huskies, Jonathan), Northeastern University (Northeastern Huskies, Paws), the Michigan Technological University (Michigan Tech Huskies, Blizzard) and University of Washington (Washington Huskies, Harry), and Houston Baptist University (Kiza the Husky). The animated series Road Rovers features Exile who is a Siberian Husky. The show Krypto the Superdog features Tusky Husky. The film Eight Below features six Siberian Huskies whose names are Max, Maya, Truman, Old Jack, Dewey and Shorty. In the horror television series Z Nation, a character adopts a Siberian Husky after its owner freezes to death outside his base, and the other dog turned into a zombie. Everest in the animated series PAW Patrol is a Siberian Husky. ^ "Siberian husky". Retrieved 2019-02-28. ^ a b c d Sheldon L. Gerstenfeld (1 September 1999). ASPCA Complete Guide to Dogs. Chronicle Books. p. 190. ISBN 978-0-8118-1904-6. ^ a b "Siberian husky | breed of dog". Encyclopedia Britannica. Retrieved 2019-02-28. ^ "The Siberian Husky: A Brief History of the Breed in America". www.shca.org. ^ a b c Brown, S K; Darwent, C M; Wictum, E J; Sacks, B N (2015). "Using multiple markers to elucidate the ancient, historical and modern relationships among North American Arctic dog breeds". Heredity. 115 (6): 488. doi:10.1038/hdy.2015.49. PMC 4806895. PMID 26103948. ^ Fiszdon K, Czarkowska K. (2008). Social behaviours in Siberian huskies. Annals of Warsaw University of Life Sciences – SGGW. Anim Sci 45: 19–28. ^ Stanley J. Olsen (1985). Origins of the Domestic Dog: The Fossil Record - Chapter 2. University of Arizona Press. ^ a b c d e "AKC Meet The Breeds: Siberian Husky". AKC.org. Retrieved 2011-08-21. ^ "American Kennel Club:Official Standard of the Siberian Husky" (PDF). American Kennel Club. Retrieved 24 May 2015. ^ "Common Husky Questions - Siberian Husky Club of Great Britain - Huskies UK". Siberianhuskyclub.com. Archived from the original on April 4, 2012. Retrieved February 2, 2009. ^ "Siberian husky (breed of dog) - Britannica Online Encyclopedia". Britannica.com. Retrieved February 2, 2009. ^ Lisa Duffy-Korpics (2009). Tales from a Dog Catcher. Globe Pequot. p. 214. ISBN 978-0-7627-5770-1. ^ a b c Diane Morgan (16 March 2011). Siberian Huskies For Dummies. John Wiley & Sons. pp. 202–203. ISBN 978-1-118-05366-9. ^ "History". My Husky. Retrieved 2016-03-16. ^ "Husky History". users.tpg.com.au. Retrieved 2016-03-16. ^ a b DK Publishing (1 October 2013). The Dog Encyclopedia. DK Publishing. p. 101. ISBN 978-1-4654-2116-6. ^ Monnet, Eric (2009). "Larageal paralysis" (PDF). AAHA/OVMA Toronto 2011 Proceedings. AAHA/OVMA Toronto 2011. March 24–27, 2011. Toronto, Canada. American Animal Hospital Association. pp. 443–445. Retrieved October 15, 2012. ^ "Your Siberian Husky: Its Hips and Its Eyes". Siberian Husky Club of America. Retrieved September 15, 2009. ^ "OFA: Hip Dysplasia Statistics". Offa.org. Archived from the original on August 22, 2008. Retrieved February 2, 2009. ^ "Journal of Veterinary Internal Medicine - Journal Information". Jvetintmed.org. Retrieved February 2, 2009. ^ "Racing Alaskan Sled Dogs as a Model of "Ski Asthma" - Davis et al. 166 (6): 878 - American Journal of Respiratory and Critical Care Medicine". Ajrccm.atsjournals.org. doi:10.1164/rccm.200112-142BC. Retrieved February 2, 2009. ^ Gay Salisbury; Laney Salisbury (17 February 2005). The Cruelest Miles: The Heroic Story of Dogs and Men in a Race Against an Epidemic. W. W. Norton. p. 252. ISBN 978-0-393-07621-9. ^ Alan H. Goodman; Deborah Heath; M. Susan Lindee (2003). Genetic Nature/culture: Anthropology and Science Beyond the Two-culture Divide. University of California Press. p. 128. ISBN 978-0-520-23793-3. ^ "The Siberian Husky". Siberian Husky Club of America. Retrieved August 27, 2010. ^ a b c d e Pisano, Beverly (1995). Siberian Huskies. TFH Publication. ISBN 0-7938-1052-3. ^ "Siberian Husky - Official Breed Standard". United Kennel Club. Retrieved 2013-10-22. ^ "American Kennel Club - Siberian Husky History". Akc.org. Retrieved February 2, 2009. ^ "AKC Dog Registration Statistics". American Kennel Club. Retrieved 2013-10-23. ^ "An iceman's best friend". Geographical. December 2006. Archived from the original on 2014-10-28. Retrieved 2013-11-19. ^ "Central Park – Balto". New York City Department of Parks & Recreation. Retrieved 2014-11-18. ^ Ken Beck (1 April 2002). The Encyclopedia of TV Pets: A Complete History of Television's Greatest Animal Stars. Thomas Nelson Inc. pp. 44–46. ISBN 978-1-4185-5737-9. ^ "Proceedings - Did You Know - Camp Century". U.S. Coast Guard. Retrieved 2014-04-02. ^ "About Mission". Northern Illinois University Alumni Association. Retrieved 2014-05-01. Wikimedia Commons has media related to Siberian Husky.